It's a Rhode Island-lover's dream ~ we've gathered the ultimate assortment of RI delicacies; Del's Lemonade mix; Black Pearl Clam Chowder (with Westminster crackers); Rhode Island Original Coffee Syrup; Nettie's Kettle Corn; Catanzaro's Biscuits; Sacred Cow Granola; Krisppe Clam Cake Mix; Newport Candy Co. Premium 1/2 lb. 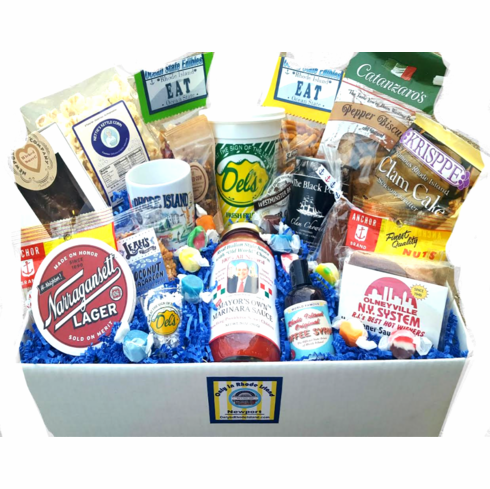 Chocolate Lobster; Mayor's Own Marinara Sauce; Olneyville NY System Hot Wiener mix; Leah's Vegan Macaroon Cookie; Del's Shotglass; Rhode Island Artisan Chocolates; Frankie Galasso-designed RI Mug; Narragansett Brewery Coasters; Ocean State Edibles Snack Mix; Virginia & Spanish Mixed Nuts; and RI Salt Water Taffy. Whew! Now, THAT'S A BASKET!